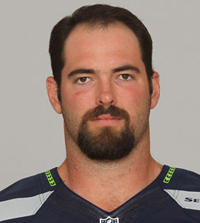 Big Island native and Seattle Seahawk Max Unger has been named to the NFC squad for the 2013 Pro Bowl. The center, who is a Hawaii Preparatory Academy graduate, and teammate left tackle Russell Okung have been selected to the starting squad in the all-star game Jan. 27 in Honolulu, the NFL announced. Okung and Unger become the first Seahawks offensive linemen to be voted to the Pro Bowl since tackle Walter Jones after the 2008 season, and the first time two Seahawks teammates were voted starters since Jones and linebacker Julian Peterson in 2008. Unger has started all 15 games this season and leads an offensive line that has allowed rookie QB Russell Wilson to throw for nearly 3,000 yards and 25 touchdowns, one shy of Peyton Manning’s rookie record, with a passer rating of 98.0. He has also helped elevate Seattle’s rushing attack to second in the NFL with 2,426 yards in 2012. Unger was drafted with the 17th selection in the second round (49th overall) of the 2009 NFL Draft and has started all 47 games played in his career. In addition to Okung and Unger, running back Marshawn Lynch and safety Earl Thomas were voted into the Pro Bowl as back-ups and Leon Washington was selected as the NFC’s kick returner. The Seahawks also have eight total alternates to the NFL’s annual all-star game. Defensive end Chris Clemons, fullback Michael Robinson and cornerback Richard Sherman are first alternates, safety Kam Chancellor, special teamer Heath Farwell and punter Jon Ryan are second alternates, quarterback Russell Wilson is a third alternate and defensive tackle Brandon Mebane is a fourth alternate. The player would be named to the team if a selected member of the NFC squad cannot participate.